Structural waterproofing products from Triton Systems have been specified for one of the largest ICF construction dwellings ever built in the UK. The 2,500m2 basement extends beyond the Surrey property where a blue-green roof will be created over a suspended podium deck to form part of the garden outside. From the outset of the project, the Triton technical team worked closely with waterproofing and blue-green roof design specialists, EPG, to create a waterproofing strategy using Type A, B and C systems from Triton’s range and utilised a comprehensive Construction Quality Assurance protocol agreed between Triton and EPG. The Triton team had been called in by main contractor, Era Build Ltd, to replace a previous waterproofing system supplier who had been unable to provide a warranty. After all detailing was complete; Triton Approved Contractor, Cast Contracting Ltd (CCL), installed the systems. BS 8102 (2009), the standard for the waterproofing of structures below ground, recommends two waterproofing layers to achieve a Grade 3 habitable basement construction. Therefore, following dig out and blinding, Triton’s BFG 5000 bentonite membrane (a Type A barrier system) was installed as the primary waterproofing layer to the floor, before pouring the slab which was made watertight with the addition of Triton TT Admix (a Type B integral waterproofing system and the secondary waterproofing layer.) The fibrous surface of the bentonite membrane is designed to bond securely to the wet concrete as it is poured. To achieve a double waterproofing layer to the walls, the Nurdura ICF panels were in-filled with concrete made watertight with TT Admix and then Triton TWS EX100 self- adhesive membrane was installed to the outside. TWS EX100 forms a secondary waterproofing layer and a physical barrier that adheres well to the Nurdura panels. 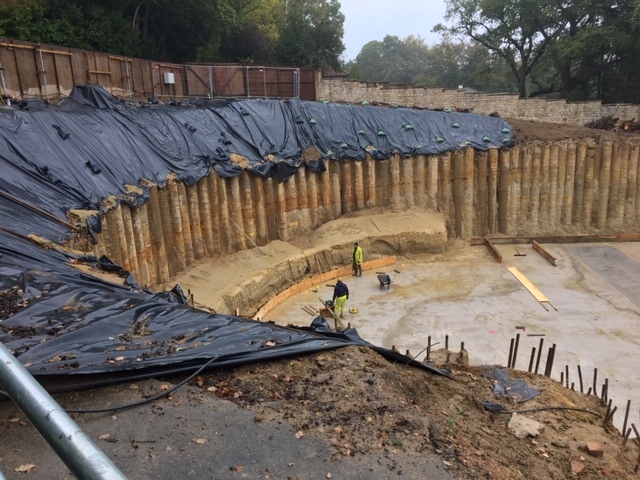 Before backfilling to the outside walls, a layer of Platon Double Drain membrane was installed over the TWS EX100 as a protection layer and to allow any water to drain down between its studded profile to a perforated, maintainable land drain to the perimeter. All construction joints were sealed using Triton’s Cemflex VB Steel Plate Waterbar. Cemflex Waterbar is an ideal construction joint sealer for use with ICF panels because it only reacts with water in the concrete and therefore doesn’t need to be protected from rain following installation before the concrete is poured. Triton Fastcoat, a robust Type A liquid applied system that will withstand water pressure from the garden, was applied to waterproof the precast concrete planks that formed the podium deck below the green roof construction. 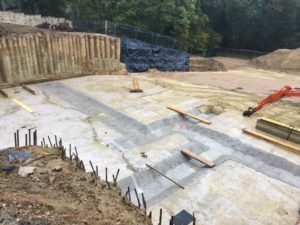 Finally, Platon P20 cavity drained membrane was used to waterproof the secant piles forming the walls of the ramp down to the basement car park. Triton supplied BBA certified, structural waterproofing products representing every type of waterproofing defined in BS 8102 (2009) for this project. When completed the basement will include car parking for 10 vehicles, a swimming pool, cinema, and bedroom suites.